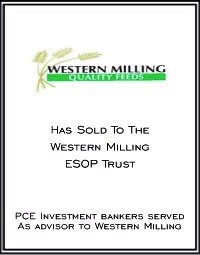 Originally founded in 1935, Western Milling specializes in the production, supply, distribution and storage of commercial feeds, grains and seeds. Western Milling employs more than 450 employees and has 32 locations across California, Nevada and Arizona. It offers dairy mixed, poultry mixed, and bulk commodities; sack feed, poultry feed, horse feed, and nutritional products; and mixed feed for various ages of cows, as well as unprocessed commodities. The company also distributes grains, such as red and white wheat, barley, milo, corn, alfalfa hay, and safflower, as well as planting seeds of various crops; and provides services, including storage and handling, drying, cleaning/screening, seed processing/conditioning, and warehousing. In addition, it owns and operates retail feed stores.